In the digital age, it is essential for your business to not only have an online presence, but to have a professional and beautifully-crafted website optimized for mobile devices. How will your guest see where you’re located, and what time you close? Where can they find your menu, and decide that’s for dinner tonight? How can they make a quick reservation without having to pick up the phone? Word of Mouth marketing is still alive, but is quickly converting to the virtual scene. 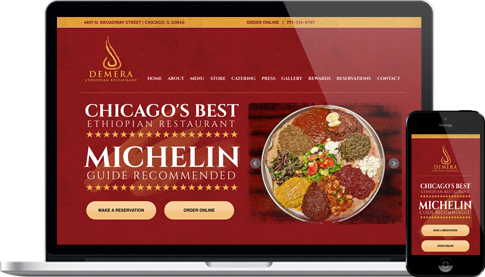 Don’t hesitate to get online, let eateria make your digital transition seamless and stylish. SEO elements to align your pages with targeted keyword phrases… don’t get lost in a search engine again! Perhaps you already have a site but need a better design or host? We can re-design any pre-existing site to stay consistent with your brand image and increase conversion rates. In addition, we can host your website and make sure it is always running fast and your data is protected! Interested in seeing what our software can do for you? Contact us at contact@myeateria.com or 855-899-5839 for your free demo!